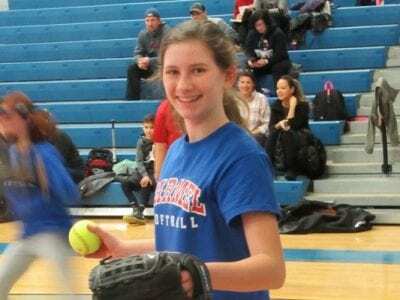 Abby Rattner, a 6th grader at the Carmel Middle School, gets ready to pitch during the clinic. Below: Camryn Menton, 7, learns several pointers from CHS varsity players Kaitlyn Dean and Kaitlyn Belmont. Photos by Eric GrossSixty girls of all ages and… Please login below or purchase a subscription to the Putnam County Courier to access this content. Carmel’s Ben Rivera took the 170-pound match, pinning Mahopac’s Frank Casagrande. Photo by Robin HawksMAHOPAC – Mahopac High School produced two individual champions on Saturday en route to a secondplace team finish in its own Peter Caruso Memorial I… Please login below or purchase a subscription to the Putnam County Courier to access this content. MAHOPAC – John Jay High School’s Alyssa Caswell had 13 points, including the buzzer-beating basket that broke Mahopac’s heart as the Patriots beat the Indians, 49-46, in a girls’ basketball game. Nicole Musacchio added eight points for Jay. Mia Klamm… Please login below or purchase a subscription to the Putnam County Courier to access this content. NEW YORK – Katie Turk and Caroline Douglas both won individual events, and Turk helped one of the relay teams to a victory as Carmel High School turned in a strong showing by finishing third in the girls Northern Counties Championships over the weeke… Please login below or purchase a subscription to the Putnam County Courier to access this content. 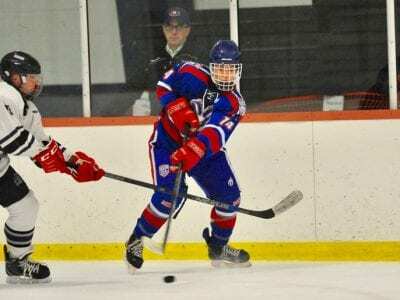 The Carmel Rams hockey team played Monroe-Woodbury Crusaders on Monday evening at the Ice Time Sports Complex in Newburgh. Here, #14 Brendan Murphy clears the puck from a Monroe-Woodbury player, and Carmel celebrates after a goal by Robert Paradiso. … Please login below or purchase a subscription to the Putnam County Courier to access this content.